Walnuts are known to have a variety of health benefits, including improving blood vessel function and fighting damaging free radicals thanks to their high antioxidant content. And now, according to new research out of Yale University, walnuts may help at-risk adults reduce their chances of developing Type 2 diabetes. To evaluate the effects of walnut consumption on overall calorie intake and dietary quality, researchers randomly assigned 81 women and 31 men at high risk of Type 2 diabetes to eat a reduced-calorie diet, either with or without nutrition counseling. The subjects were from 25 to 75 years old and all had several risk factors for Type 2 diabetes, including having high blood sugar, blood pressure, or cholesterol; being overweight; or having excess fat around the middle. Half of the participants in each group were additionally assigned to add 56 grams (roughly 2 ounces) of walnuts to their daily diets for six months. After a three-month break, the groups were then switched, such that all of the participants consumed walnuts for six months during the study period. Taking into account various factors such as age and physical activity, the researchers found that, in addition to improving dietary quality, eating walnuts lowered LDL (“bad”) cholesterol levels and improved blood vessel function — both risk factors associated with Type 2 diabetes. Additionally, although they are high in calories, the nuts were not associated with weight gain during the study. 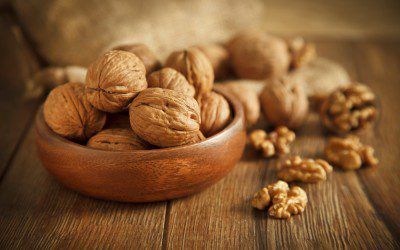 Walnuts did not appear to reduce blood sugar or blood pressure levels. “Adding walnuts to your diet will improve your diet quality and health — cardiometabolic health specifically — and you can add walnuts without fear of weight gain because they are very satiating and appear to bump out other calories quite reliably and make room for themselves,” noted study author David L. Katz, MD, in an interview with Reuters. Limitations include that participants self-reported their diets based on recall of what they ate in the previous 24 hours and that the study was not specifically designed to show whether walnuts can prevent diabetes. The research was funded by the California Walnut Commission. The investigators state that further research using a more varied sample of participants is necessary to fully evaluate the health benefits of walnuts. What are the causes of the diabetic neuropathy, what symptoms and tests play a role in diagnosis, and what steps can be taken to decrease the likelihood of developing this condition? Bookmark DiabetesSelfManagement.com and tune in tomorrow to find out.